Mariko dies this issue, mercy killed by Wolverine to spare her a long, painful death by blowfish toxin after she was poisoned by Reiko at Matsu'o & Silver Fox's behest. Though she hasn't been around much of late, it still marks a tragic end for a character that dates back to the classic Claremont/Byrne days. Hallucinatory and alternate reality appearances aside, the character has remained dead. 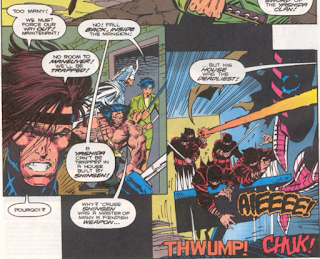 This is the issue of the series drawn by Marc Silvestri, as he too leaves Marvel to join his fellow X-artists over at Image, ending a run on this series that goes back to issue #31 and with the character that goes all the way back to Uncanny X-Men #218 (barring fairly consistent fill-in work, of course), which is a pretty remarkable artistic run for any character/series. 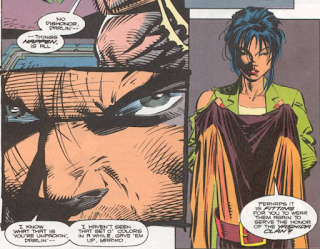 Mariko asks Wolverine to wear his old brown-and-orange costume in defense of her home; not sure why that is, unless Silvestri just wanted to draw him in that costume one last time. This issue reveals that the ancestral home of the Yashida clan was heavily booby-trapped by Mariko's father Shingen. Matsu'o has had the hand Wolverine cut off in X-Men #7 replaced with a bionic one that is capable of being launched, not unlike Kane's hands. I've always been conflicted about Mariko's death in this issue. On the one hand, she's barely been used since the mid-late 80s, having never appeared and barely been mentioned in this series prior to this story. Once it became clear that Marvel was never going to let one of its most popular characters get married, her and Wolverine's relationship stalled out, and even Claremont himself largely ignored it after that point, having Wolverine die and come back and perpetuate a ruse that he was still dead with nary a thought given to how it might effect Mariko, let alone showing readers her reaction to the news that he was dead, and then to the news that he was not. If the character isn't going to be used anyway, and won't ever be allowed to move her relationship with Wolverine forward, why not kill her off, and wring as much pathos out of it as possible? On the other hand, killing a character is always tricky (an unused character can be dusted off with ease; a dead one, especially an otherwise "normal" civilian character, less so), especially when said character is, at least technically, the love interest of the main character (the event which gave us the phrase "Women in Refrigerators" hasn't occurred yet, but Mariko is very definitely fridged in this issue, her death occurring only because of the impact it will have on Wolverine). Mariko's lack of presence in Wolverine's life prior to this story also takes away a lot of the impact fridging her is supposed to have (if Wolverine's barely mentioned or thought of her in the previous 53 issues of his series, let alone all those concurrent and previous X-Men issues, is her death really that big a deal to him? ), as does the means in which it occurred (carried out by an agent of Matsu'o & Silver Fox, two relatively new characters with relatively young grudges against Wolverine; this is hardly Sabretooth, or even someone like Silver Samurai, getting a big win against Wolverine). It also doesn't help that, in hindsight, this loss won't really have that big an impact on Wolverine, aside from giving him someone who can appear in his dreams or alternate realities and be immediately suffused with extra meaning. The best thing that can be said for the death is that by having Reiko be the direct agent of Mariko's death, it creates a nice bookend to the Hama/Silvestri run, using a character from their first story to close out their last, and the desire of the creative team to end a run that has revitalized this series on a big, impactful note is understandable. The issue itself is well-crafted, if a little dense; given how much of the previous issue was ninja-fighting filler, it would have worked better if some of this issue's plot machinations had occurred there, just to give some moments, like the reveal of Matsu'o & Silver Fox's ultimate goal, more room to breathe, and the ending is also abrupt, cutting from Wolverine refusing to use his claws on Mariko to him emerging with her dead body (so much so that I thought I missed some pages), and while the actual moment of her death doesn't need to be depicted the moment when Wolverine ceases his objections and decides to do what she's asking seems like an important one to show). There's also a definite feeling of almost Shakespearean tragedy infused into this issue, with the bad guys just straight up winning the day outright, which is rare but occasionally welcome in serialized fiction. 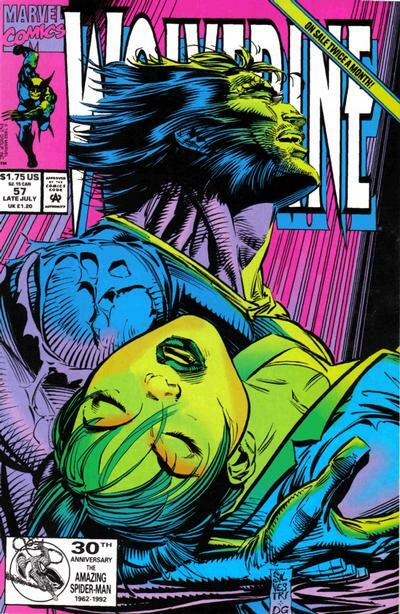 There's no denying that Mariko's death is a loss for Wolverine; the impact of it, however, and thus the justification for it as well, would be greater if the series prior to this had done more to show just how tremendous a loss it is, instead of simply telling readers how big a deal Mariko is here, at the last possible moment. Next week: Uncanny X-Men #291, X-Force #13, X-Factor #81. I buy it. They're grown-ups in love and both with strong sense of responsibility, or giri if you like, and neither is into lower Mississippi teen love dramatics. Both accept the circumstances that unavoidably keep them apart as is and it's easier for them to just keep out each other's eyes while that is the situation. Logan's "death" in FoTM may in fact have been kind of a blessing to both in that sense. 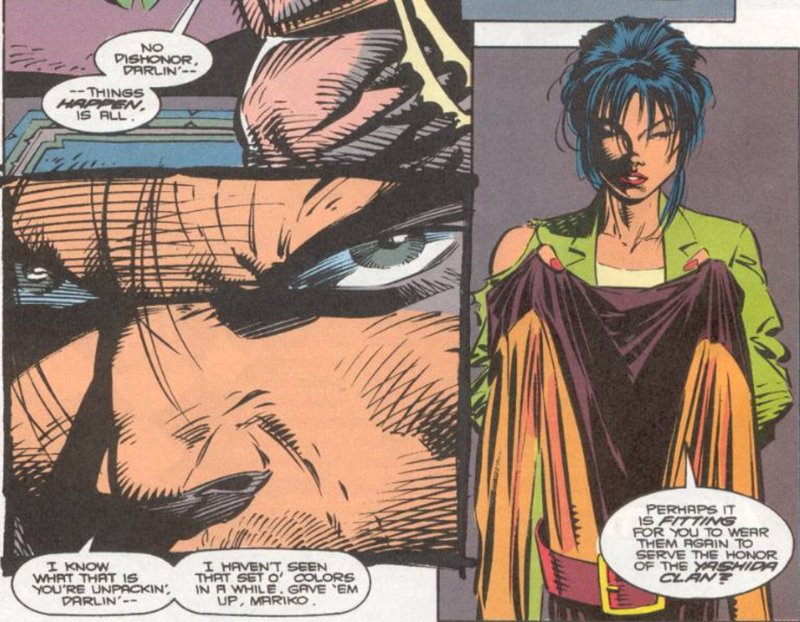 But, during the outback era Logan had Mariko's picture curiosity on the show there while discussing his Mardipoor escapades with Storm, whom he allegedly were being friends with benefits around the time. The Reavers were discussing of escaped Wolverine not putting Mariko and Amiko in danger. The flame's there and it's alive and it is an important point that they would now be freed of the shackles of those responsibilities. It's pretentious to talk of it as Shakespearean, but goddamn it is so Shakespearean. "Mariko asks Wolverine to wear his old brown-and-orange costume in defense of her home; not sure why that is, unless Silvestri just wanted to draw him in that costume one last time." I read somewhere that brown and orange are the colors of the Yashida clan, explaining why Logan changed costumes post-Dark Phoenix. Horrible implication, as he changes back to blue-yellow the minute he moves back to under the same roof with Jean and the story right before this one teases the auld Scott-Jean-Logan love triangle through Mystique. It's almost like Mariko gets moved away here to chase that path. 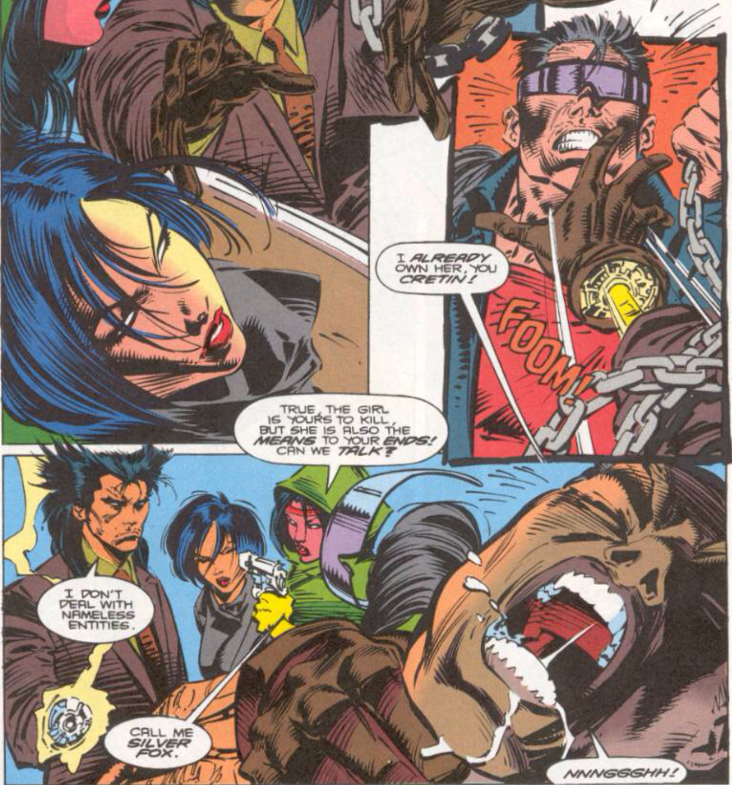 Somewhat curious that again it's Spiral whose actions send Logan to Japan through Jubilee's misplacement for all this to happen and that it's last of the Reavers, Claremont's editorial stand-ins, who keeps Logan occupied for Mariko's death to happen. Couldn't it just be that he wore that outfit when he fought for her against Shingen, so she thinks it would be appropriate for him to wear it here as well? To be clear, I'm personally more interested in the real world question of why they went that way. Did Hama request it? Silvestri? Was it a last hurrah thing for Silvestri, or did Hama think it made more sense for Mariko to have a copy of that costume? Etc. Either you forgot the Nutshell logline or you’re suggesting the best synopsis for this issue is the black void of death. I did not know this. Not cool, Hama, especially in an issue that struck me as decidedly subpar in the scripting department, never mind her general disuse. 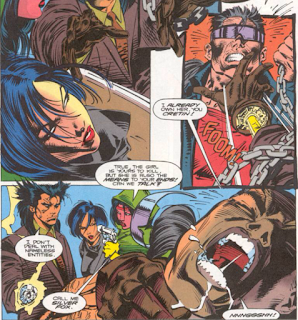 We do get a “snikt” that the other characters react to, right before Logan emerges with Mariko’s body, although that ending is still quite abrupt. Man, I really wish I could say it was the latter. 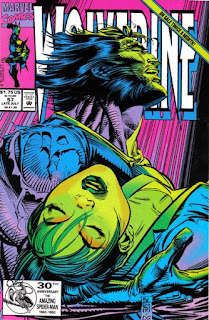 Yeah, I have no qualms with the way Hama & Silvestri tell us that Mariko died, with the little snikt followed by Wolverine holding her body. It just goes from Wolverine refusing to use his claws to Wolverine using his claws, and it seems like showing us the means or at least the moment in which he goes from the former to the latter might be worthwhile. I think doing it by the very cinematic trick of showing other characters react to what's the equivalent of a gunshot from the next room is okay, especially on the heels of the equally film-like exposition cut scene from the villains telling what goes to showing it. The page about Jubes and Yukio watching Cylla limp away probably is in the wrong place though for the flow of things. We've seen Wolverine's approach on the matter of adamantium claw -induced euthanasia on the one hand in UXM #166 and on the other in #205 where he refused the mercy from Lady Deathstrike, so it works for the readers who have those scenes in their character toolbox. Of course there's being lot of overhaul in readership in betwixt these particular years so maybe ditching the "every issue is someone's first" approach in that sense is not so successful one. I find it kind of book-endy. Mariko becomes an actual character in the context of UNCANNY during the Paul Smith run, which had the momentous moment in #166 where Logan decides that he owes his Brood-infected loved ones his life... or quick, clean death. The "walk the walk" moment has come. I was actually shocked at the time, as my back issue absorption was such that Marino looked very large in the Logan legend. It seemed really huge. The execution did feel rushed though, as you say. In retrospect it's easy to see this as more of the same post-Claremont housecleaning that also killed the Reavers, the Hellions, etc. Reading it now, I like it. The detail that makes it work (for me) is that she dies having purged the Yashida house of its criminal ties, the big stumbling block to her wedding Wolverine. That's a nice little dramatic/tragic irony. And while it's delayed because of fill-ins, the "mourning" sequence in issue 60 is a suitable epilogue. 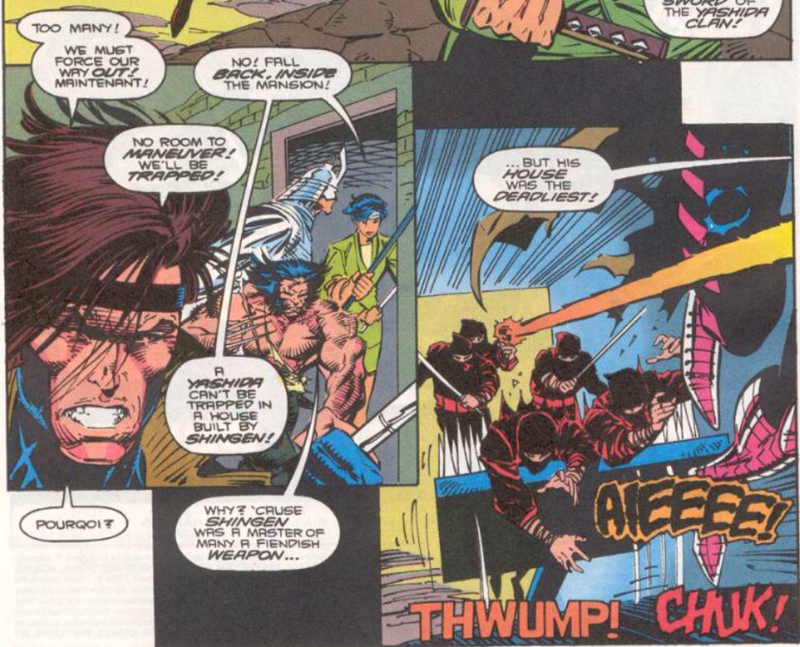 I agree that Silver Fox being the murderer is bad, but then I hate the whole Silver Fox retcon in the first place. Jason, I'm enjoying your autocorrect woes. I had forgotten about the time Sylvester drew Marino in that one issue of WOLVERINE. He was too much ahead of his time of course, but Marvel must have been kicking itself in hindsight for some years now for getting rid of Wolverine's lover Marino so soon. Oh, again, I don't know. Technically I should be there with you about Matsu'o and Silver Fox as singular new characters being unworthy, but if you read it like it's the combined forces of the Hand and the Hydra who finally manage to revenge themselves on Logan after the Madripoor Knights shenanigans it works for me. Again we return also to UNCANNY #172-173 and, even if the Viper wasn't the Madame Hydra anymore and even if Silver Fox being now the acting one is a bit meh, goshdangit if it isn't appropriate that she's there when Mariko is finally successfully poisoned. If they only had done it right like Nathan Adler has proposed and revealed that it was Baron von Strucker who was behind the Experiment X. Viper having been the Madame H who was more the thorn in Captain America's flesh, the Madripoor Knights reveal itself to have been quite a nodsworthy retcon. And, if there is hypothetically an element of fridging to be found here, I must note that it is a female conspirator who manages to kill the female love interest, through the usage of a female assassin and a female cyborg to keep the titular hero busy while the former's at it. Each have their own separate on-going motivations and character arcs. If one was to set out to fail the Bechdel test on this one because "yeah but they all talk about the male characher all the time!" it would be a petty notion. It flies under the radar, but Mariko's ultimate undoing is voluntarily agreeing to do a thing full in the Yakuza way, after she has so hard tried to cut the clan from its criminal underworld connections. Oh, shuck. I can't remember in Nathan already suggested it, but Department H secretly being Department Hydra would've been kind of awesome.